Oculus Rift + Touch includes the headset, 1x Xbox One Controller, 2x Oculus Touch controllers and 2x Oculus Sensors. Additional Sensors needed for room-scale tracking. Playing games from outside the Oculus Store requires enabling Unknown Sources. 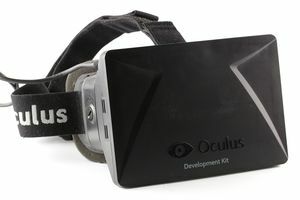 Some games may only support Rift DK1 or DK2, and not support the Consumer Version of the Oculus Rift. LibOVRWrapper can make some DK1/DK2 games compatible with the consumer headset. 90 Hz Low Persistence OLED, 110° FOV. The Oculus Rift uses the Oculus Sensor camera to track the headset and Touch controllers positional via Constellation tracking. 1x Oculus sensor allows for seated play with an Xbox One Controller or Oculus Remote. 2x Oculus Sensors allows for standing with Oculus Touch controllers. 3x Oculus Sensors allows for room-scale tracking with Oculus Touch Controllers. Integrated headphones and microphone. Headphones can be replaced with earphones. 4m cable, Hardware adjustable IPD and Proximity sensor. Comes in the box, can be used to play simple movies and experiences that don't require interaction or gameplay. Comes with a wireless Xbox One Controller and Xbox Wireless Controller Adapter for Windows. 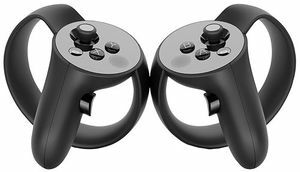 Oculus Touch comes with an additional Oculus Sensor, and can be either be bought separately from the Oculus rift, or brought together in the Oculus Rift + Touch bundle. they use positional tracking, and have a thumbstick, trigger, grip analogue, two face buttons and a system button. The thumb and the index finger are positionally tracked. 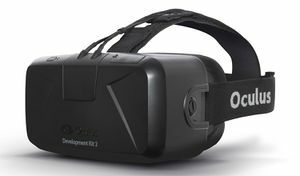 Oculus Rift Development Kit 2 aka DK2 was the second release of the headset for developers. Supports seated and standing positional tracking. It is still supported within Oculus Store, and can be used with an Xbox One Controller to play non- touch controller games. 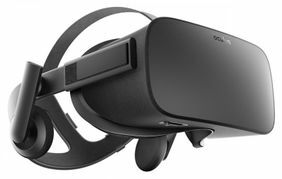 Some games on Steam will only support the Oculus Rift Development Kit 2, and will not work with the Consumer Version Oculus Rift. 75Hz Low Persistence OLED. 100° FOV. Positional tracking with Oculus DK2 IR Camera via Constellation tracking. Oculus Rift Development Kit 1 aka DK1 was Oculus' first release of a headset. It only supports rotational tracking, o positional tracking, thus it can only be used for seated and a few standing rotational experiences. It not supported by the Oculus Store. Some games on Steam will only support the Oculus Rift Development Kit 1, but will not work with the Consumer Version Oculus Rift or Oculus Rift Development Kit 2. 640 x 800 per eye. Total resolution of 1280 x 800. 60Hz High Persistence LCD. 110° FOV. Rotational tracking only, using Gyroscope, Accelerometer and Magnetometer. This page was last edited on 17 September 2018, at 06:06.